Oreos And Peanut Butter The Dynamic Duo! In 1998, director and writer Nancy Meyers introduced us to the classic remake of the movie The Parent Trap! One classic scene is the iconic snack combination that has stood the test of time, Oreos and peanut butter. If you're a 90s kid, you can probably quote this entire scene, but just in case, here's a recap. When Hallie Parker and Annie James find themselves forced to stay together in the "isolation cabin"at Camp Walden after a series of pranks that go just a little bit too far, they finally begin to bond over a shared love of eating Oreos and peanut butter. After seeing the film for the very first time, many of us went straight home to see what peanut butter and Oreos tasted like, and for some of us, it became a favorite treat from that day forward. However, we had never really thought about where the wacky yet delicious combo had come from and apparently even Nancy isn't exactly sure. Nancy told HelloGiggles, "I forgot I even wrote that. I have no idea [where I came up with it]. I think it was just something weird that both girls would like. It was another example of the fact that they’re twins. 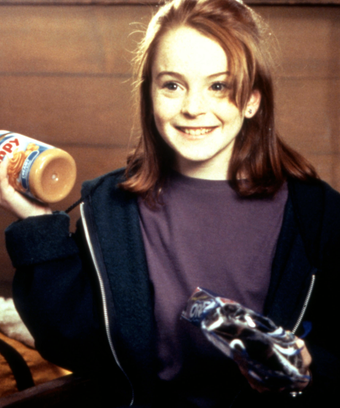 I just made up [peanut butter and Oreos] for no reason other than it sounded weird and some cute kid would do it." So there you have it....it was completely made up!! !